You are here: Home / Blog / Galapagos Clothing - What Should I Wear? You’re planning a trip to the Galapagos and you don’t want to be the one that has to do the “unpack of shame” at the airport. How do you pack light and make sure your clothes match the weather? The short answer is to bring light clothing that is quick drying, layerable, and gives you good coverage from the sun. Read on, though, for detailed and specific information on exactly the kind of clothing that will let you pack light and be as comfortable as possible in the Galapagos Islands! The full packing list for Galapagos clothing (in proper list form) is at the bottom of the article. Some say that this is the most important element in a well-planned pack. It probably is. There’s a ton of walking to be done in the Galapagos, and it’s not all on paved sidewalk. Actually, not much of it is. Terrains can be sand, uneven terrains, hiking volcanoes, hills, and beaches. Your landing will vary from wet landing (on the shore of the beach) to dry landing (in a dock or similar). Most people find that it’s practical to have two sets of footwear – one good pair of sandals, and another pair of quick-drying hiking shoes with good grip. Feel the Sand in your feet! For sandals, you want something that will stay securely on your foot and be comfortable to walk around in. You’ll also want to avoid Velcro. 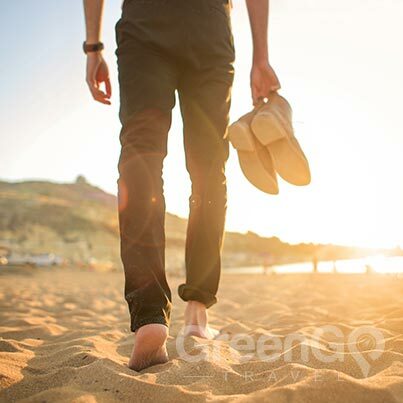 The fine ocean sand can easily clog the Velcro, leaving you with sandals that track sand everywhere and won’t stay closed. You’re better off coming with sandals that have clips, buckles, straps, or something along those lines. You’ll also want to make sure that the soles are made of something that doesn’t absorb water, like a closed-cell foam or something along those lines. That way they’ll get a chance to dry out if you go kayaking or have a wet landing, which is very common here. Teva’s sandals are really popular for both men and women, since a large percentage of their models cover these requirements and they’re great quality. For hiking shoes, quick-drying is really a practical feature. Most people (that are happy with their footwear, anyway) opt for something with a lot of mesh for breathability, that can dry in about an hour with some good sun, and with solid grip for hiking along volcanic rock trails. The ones that I wear are from Keen and I love them. Either way, make sure that whatever you bring is comfortable for long walks. 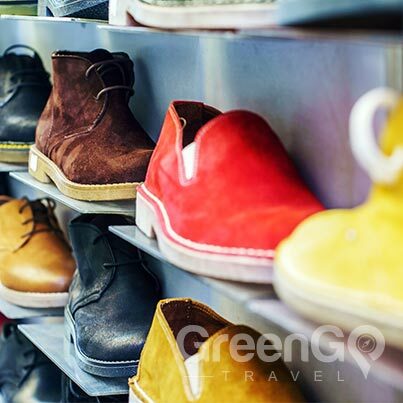 If your footwear is new, take the time to break them in before you arrive in the Galapagos. The last thing you want is to have to stay behind on some of these amazing hikes because of a few blisters. Honestly, if you bring just regular cotton socks, nobody is going to suffer horribly. They’re just not as comfortable when they get wet. What really work great are athletic socks that are a synthetic blend, along with a pair or two of wool or wool blend hiking socks. Moisture wicking does an awesome job of keeping you comfy if you’re hiking on a hot day, or if you get a shoeful of water when you’re pushing off in your kayak! This is a must. The sun around the equator can be really intense, even if the weather seems cooler. It’s really easy to underestimate here (because it doesn’t feel like it’s so strong) and then you can quickly end up with heatstroke. Not fun. Bring something lightweight, breathable, and that won’t blow off easily. Usually the Galapagos Islands are pretty calm, but you’ll still get the occasional breezy day. It’s ideal if your headwear has a decent brim all around that will keep the sun off your face and the back of your neck. Cotton T-shirts aren’t a bad choice, honestly. Usually they can dry out fast enough, and they are comfortable. Synthetics are a really great option and can perform much better than a regular cotton tee in any kind of weather. You’re best off with a combination of short and long sleeves. Sometimes the sun is just too intense for a tee shirt, so a long sleeve with good UV protection will keep you in great shape throughout your visit & also aid as a repellent against mosquito bites. The real key for the top half is good layering. Go with light layers that can be added or removed as necessary. It’s also a good idea to bring at least one layer that’s a bit warmer, just in case. This could be something like a light zip-up hoodie, or a light fleece sweater. It can definitely cool down around night time. Most people call this the mid-layer. You’ll want to bring both pants and shorts. The shorts are great for beaches, but pants are more practical for hikes and sun protection. For pants, something light, breathable, and (this shouldn’t be a surprise by now) quick drying is by far your best bet. Jeans are usually a pain since they take forever to dry out and can be very hot in the Galapagos sun. Another nice feature in quick drying pants is something along the lines of Ripstop. Quick-drying clothes have the potential to tear a little more easily, but features like this will prevent it from going too far. There can be the occasional really wet day in the Galapagos, so you’re going to want to pack something practical against this. This is also really easy to mess up. If it isn’t breathable, you’ll be walking around in a sauna. That’s why it’s not a good idea to bring something that’s fully waterproof . You’ll be so hot it in (even on a cooler day) that you’ll be wetter with sweat than if you just were to have not worn it at all. What’s ideal is a light, breathable jacket that’s water-resistant. If you carry a back back with you, something easy to store comes in really handy. We don’t have monsoons here. Anything that’s heavy will be more uncomfortable than it’s worth. Here’s the packing list that’s perfect for a 1-week visit to the Galapagos. Honestly, a lot of people find that packing for 1 week is ideal regardless of how long they’re actually staying. There you have it! Beyond these Galapagos clothing items, a day pack can be a great thing to have for lugging around your cameras, water bottles, and dealing with the layers you don’t want on as the day warms up. 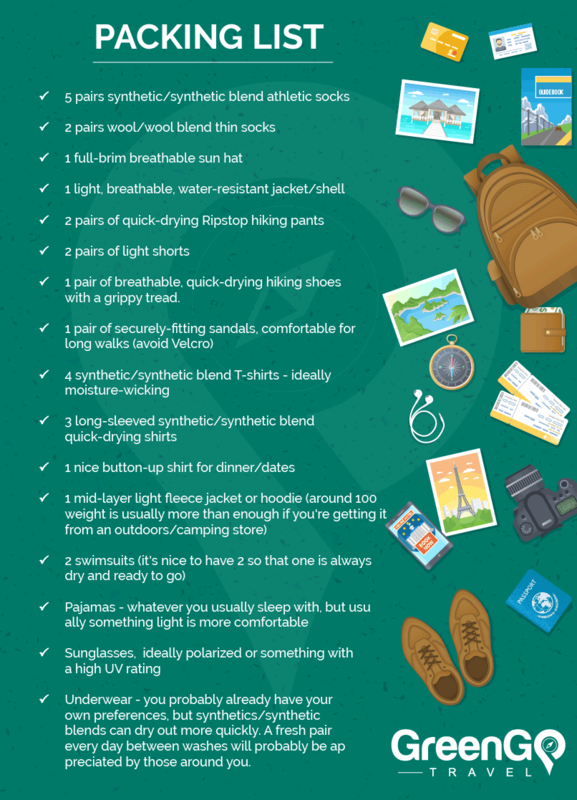 Follow these suggestions in this packing guide, and you’ll be traveling the Galapagos like a champ! We hope you found this list helpful. If you are still planning your travel, our trip advisors are here to help! We have the fastest & most efficient service in the market! Our travel planing services are free, with no payment or commitment involved. Visit the Galapagos, and travel green.